Welcome to ukssscjob.in. 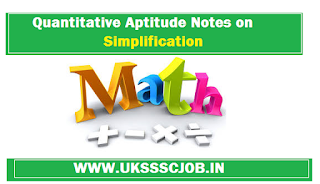 Here we are providing Notes on Mathmatical Simplification the basics of Quantitative Aptitude. 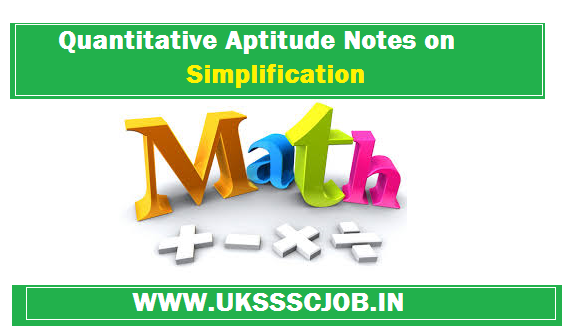 This will helps to build up concepts who are weak in maths section for Candidates get all the MATH STUDY NOTES related to many govt. sector exams like UKSSSC EXAM, RPSC, IAS, RAS, FCI, CLAT, SSC, UPSC, MAT, REET, Patwari, Gram Sevak, NDA, CDS, AAO, LIC, IBPS, Police, Forest Guard, Railway, AAI, Clerk., Kindly make use of this page and do comment about the quality of the content. 10. If a+b+c=0, then a3+b3+c3=3abc. All counting numbers together with zero form the set of whole numbers. (I) 0 is the only whole number which is not a natural number. (II) Every natural number is a whole number. All natural numbers, 0 and negatives of counting numbers i.e.,…,−3,−2,−1,0,1,2,3,….. together form the set of integers. (i) Positive Integers: 1, 2, 3, 4….. is the set of all positive integers. (ii) Negative Integers: −1, −2, −3… is the set of all negative integers. (iii) Non-Positive and Non-Negative Integers: 0 is neither positive nor negative. So, 0,1,2,3,…. represents the set of non-negative integers, while 0,−1,−2,−3,….. represents the set of non-positive integers. A number divisible by 2 is called an even number, ex. 2, 4, 6, 8, etc. A number not divisible by 2 is called an odd number. e.g. 1, 3, 5, 7, 9, 11 etc. Numbers greater than 1 which are not prime, are known as composite numbers, e.g., 4,6,8,9,10,12. (i) 1 is neither prime nor composite. (ii) 2 is the only even number which is prime. (iii) There are 25 prime numbers between 1 and 100. "The remainder is r when p is divided by k" means p=kq+r the integer q is called the quotient. A number n is even if the remainder is zero when n is divided by 2: n=2z+ 0 or n=2z. A number n is odd if the remainder is one when n is divided by 2: n=2z+1.